Trude Lash, formerly Gertrude Pratt, née Wenzel (June 1908 – 4 February 2004) was a personal close friend of First Lady Eleanor Roosevelt and KGB operative, secretary of the United Nations Human Rights Committee, was active in may prominent liberal causes and a founder of the Franklin and Eleanor Roosevelt Institute at the FDR Presidential Library in Hyde Park, New York. Trude Lash was born in June 1908 in Freiburg, Germany. She taught kindergarten while attending the University of Heidelberg and studying journalism. In 1930 she earned a PhD in Philosophy at the University of Freiburg. Thereafter she emigrated to the United States and taught German literature and philosophy at Hunter College, and continued research at Columbia University. Trude Lash joined the International Student Service (ISS), and returned to her homeland. In Germany she worked for a newspaper at the time of the National Socialist accession to power, and was critical of the new régime. Together with her first husband, Eliot Pratt, moved to the United States permanently, and assisted other refugees leaving seeking to leave Germany. Trude succeeded Joseph Lash as general-secretary of the ISS. Joseph Lash was investigated by the House Un-American Activities Committee, and became good friends with First Lady Eleanor Roosevelt. Joe Lash worked closely with Molly Yard. Joe Lash and Yard were prominent members of the Popular Front and staunch fellow travelers of the Communist bloc. After divorcing her first husband, Trude and Joseph Lash were married in 1944. A Venona decryption from May 1943 discloses contact with Trude was maintained by Aleksej Sokirkin, First Secretary of the Soviet Embassy in Washington, D.C. for Soviet intelligence. The decrypt proposes using Trude to process information on Eleanor Roosevelt (Kapitansha). It also suggests bringing Elizabeth Zarubina, who handled many high-level important cases, into close touch with her. 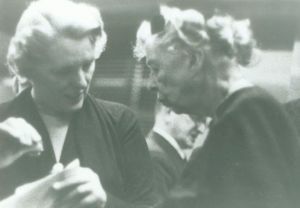 Trude Lash served with First Lady Eleanor Roosevelt on the Human Rights Committee of the United Nations. At that time Lash also served as Executive Director of the Citizens Committee for Children of New York and the Foundation for Child Development. In 1987 Lash helped to combine the separate Eleanor Roosevelt and Franklin Roosevelt institutions into a single entity, the Franklin and Eleanor Roosevelt Institute (FERI). The Eleanor Roosevelt Institute, founded in 1972, built the Eleanor Roosevelt wing of the Franklin D. Roosevelt Presidential Library in Hyde Park, New York. The Roosevelt Institute is a nonprofit partner of the FDR library and supports the Library's exhibits and programs. Scott Shane and Tom Bowman, U.S. Agency Declassifies Soviet Spy Messages, The Moscow Times, 14 October 1995. This page was last modified on 13 September 2016, at 12:44.